San Diego’s Gaslamp Quarter is where history, fine dining, shopping and entertainment come together in sights, sounds and tastes. In fact, the 16-block area between Fourth and Sixth avenues, Broadway and the waterfront has been designated a National Historic District. Here you will find many beautifully reconstructed buildings from a bygone era. These buildings now house fashionable restaurants, popular nightclubs, galleries, shops, stylish apartments, lofts and impressive offices. Architecturally, the Gaslamp Quarter contains many of the best Victorian-style commercial buildings constructed in San Diego. San Diego’s New Town had its beginning when businessman Alonzo Hor­ton, founder of downtown San Diego, first built his wharf at the foot of Fifth Avenue. Today, there is a new appreciation for the grand old buildings. This change has come about as a result of the efforts of the Gaslamp Quarter Historical Foundation and Council, the City Planning Depart­ment, as well as numerous local ­merchants. The Gaslamp’s renaissance is seen in more than 200 restaurants, shops, galleries and nightclubs that now fill the area. The mixture contributes to the Gaslamp’s two personalities. By day it’s a shopper’s paradise with such destinations as Lucky Brand Jeans, Tatyana Boutique and Urban ­Outfitters. By night the mood changes, and the area comes alive with the laughter and energy of people out on the town for a night of dancing, dining or just to see the amazing sights. Cars cruise Fifth Avenue, both to see and be seen. The Gaslamp becomes alive and electric. Some of the best nightclub entertainment in San Diego County is in the Gaslamp Quarter. It includes everything from salsa music to rhythm and blues to flamenco dancing! An excellent place to park is at Ace Parking’s 6th and K Parkade (25) (619-233-3994). See map. This 1,000-space public parking structure is located at Sixth Avenue and K Street adjacent to the Gaslamp Quarter, PETCO Park, and the Omni and Marriott hotels. The well-lit, seven-story structure offers daily parking rates of ($8) for 0-2 hours, ($15) for 2-12 hours, and a ($20) flat rate after 6 p.m. For San Diego Padres games a flat rate of ($15) is the lowest you’ll find. There’s even a pedestrian bridge crossing from the garage directly into the park! Rates for other events may vary. Cash or credit card only. Another alternative for parking is the centrally located Westfield Horton Plaza (26) parking structure. Parking is free for the first hour and ($2) for every additional 15 minutes. Event flat rates, 8 p.m.–5 a.m., Sun.–Wed. are ($10) and Thurs.–Sat. are ($20). Select retailers offer validation inside their store locations. Many restaurants also offer valet parking, so parking isn’t a big problem at night. The SAN DIEGAN offers you a great walking tour too and can begin anywhere along the tour route. Simply find your location on the Gaslamp map and follow the numbered sequence, which will enable you to see all of the recommended places. Since many people come to the Gaslamp Quarter from the San Diego Convention Center, our tour begins just across the street from the convention center at the foot of Fifth Avenue at Harbor Drive (see map). In total, you can see eight blocks of nightclubs, restaurants and shops on both sides of the avenue. Along the way you will see many fascinating stores, shops and restaurants. Near the foot of Harbor Drive and Fifth Avenue is the one and only Hard Rock Hotel San Diego (1) at 207 Fifth Ave. (619-702-3000). On the fourth floor is their ultra chic outdoor lounge called Float. By day Float is an amazing place to soak up the rays by the pool, and at night it is transformed into a swanky and vibrant nightclub under the stars. It also offers a bird’s eye view of the Gaslamp ­Quarter. Across the street is a fabulous seafood restaurant called Lou & Mickey’s (2) at 224 Fifth Ave. (619-237-4900). Walk into Lou & Mickey’s and you know you’re enter­­ing a popular seafood restaurant. The first thing you’ll see is a raw bar in the foyer offering build-your-own seafood selections, which is overflowing with fresh oysters, lobster, scallops and more. Sit at the nickel-top bar and enjoy a glass of wine from their 200-plus item wine list. The patio is also a popular spot for people watching. Next door to Lou & Mickey’s at 226 Fifth Ave. is a shopping destination called Bubbles Boutique (2) (619-236-9003). It’s bursting with eye-catching costume jewelry and accessories for women. A favorite family dining destination is The Old Spaghetti Factory (3) at 275 Fifth Ave. (619-233-4323). It features casual Italian food for the entire family. This large restaurant consists of four levels. Two are for dining and on the top floor is a family-friendly lounge complete with a fireplace! Another place that’s made a name for itself is The Wine Bank (6) at 363 Fifth Ave. (619-234-7487). They carry more than 1,000 brands of wine. A daytime excursion you should not miss is the historical walking tour of the Gaslamp Quarter conducted by the Gaslamp Quarter Historical Foundation volunteers. You’ll be enthralled with stories of yesteryear. Offered Saturday at 11 a.m., this in-depth tour costs ($20) for adults, seniors and active military is ($15), students pay ($10), and children 7 years and younger are admitted free. Also, ask about their self-guided private tours and charter tours. The tour begins at the charming William Heath Davis House (7) at 410 Island Ave. (619-233-4692). This is the oldest surviving wood frame structure in downtown. The William Heath Davis House was built in 1850 in Portland, Maine, and then brought around the horn to San Diego. Today it’s also home to the Gaslamp Quarter Historical Foundation. The house is open for touring Tues.–Sat., 10 a.m.–4:30 p.m. and noon–3:30 p.m. on Sun. Guests have been known to have caught glimpses of the resident ghost, said to date back to when the house served as a hospital. Their small park is a perfect spot for a wedding (619-233-4692). One block north is the Ghirardelli Ice Cream and Chocolate Shop (9) at 643 Fifth Ave. (619-234-2449). Look for the friendly greeters offering free chocolate samples in the foyer. This is a very popular place for families and couples who want to share a hot fudge sundae. Market Street (see map) is a main thoroughfare filled with lots of delicious discoveries, including Lotus Thai (12) at 906 Market St. (619-595-0115). Use their discount coupon for 15% off your entire bill. But even without a discount, this place is definitely worth a visit. See restaurants. At the corner of Fifth Avenue and F Street is The Tipsy Crow (10) (619-338-9300) formerly known as The Bitter End. This is the new spot to be in the Gaslamp on Fri. and Sat. nights. This three-level bar and nightclub has an underground dance club as well as The Nest, a swanky lounge on the top level. Across the street is a fabulous boutique hotel located right in the middle of the action. The Keating (11) at 432 F St. (619-814-5700) offers swanky and modern accommodations in a historic Gaslamp building. Each of its 35 rooms is unique and reflects the design aesthetics of ­Pininfarina, the same design team that produce Ferraris! A block and a half north is the San Diego location of the House of Blues (12) at 1055 Fifth Ave. (619-299-2583). This renowned company’s ninth club features a multi level music hall, where they host national and local entertainers. The House of Blues is also home to their famous Gospel Brunch. Enjoy uplifting gospel performances while you feast on a Southern inspired buffet. The brunch begins at 11 a.m. and is ($44) for adults and ($22) for children under 12, and must be pre-booked either online or by phone. Also at the House of Blues is their Crossroads Restaurant featuring celebrity chef Aaron Sanchez, who has introduced a bold new menu that’s both classy and contemporary. Dinner is served from 4 p.m. Tues.–Sun. They also have a happy hour daily from 4 p.m.–7 p.m. And for a live music venue, the House of Blues is the place! After experiencing the best of the best on Fifth Avenue, head over to Fourth Avenue. Here you’ll discover a number of fantastic restaurants, a live theater venue and great nightlife. 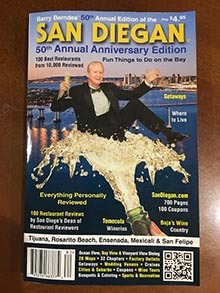 Near the corner of Fourth Avenue and Broadway is one of the top five most recommended restaurants in San Diego County. It’s called Rei Do Gado Brazilian Steak House (13) at 939 Fourth Ave. (619-702-8464). This Brazilian steak house will give you something to talk about as well as something to rave about. Find yourself a cozy booth or comfortable table and get ready for a meal to remember. Since you don’t pay extra for the best booth, ask for 101. Included in the price is an all-you-can-eat salad bar extravaganza, which is a meal in itself. But try not to overeat, because the main course is the show stopper. The real excitement begins when tall, handsome passadors or servers pass through the dining room with three-foot-long skewers of mouthwatering filet mignon, savory top sirloin, delicious ribs, sensational chicken, memorable lamb and lean ham. They offer up to 20 varieties of meats and each is grilled to perfection. Best of all you can have as much as you want! When you have had enough, you simply turn the small barbell on your table from green to red. See Restaurants. Two other places to see on Fourth Avenue are The Shout! House (14) and Hooters (15). They are popular places to grab a bite to eat. If it’s classic Italian cuisine with attentive service that you are looking for then you’ll want to dine at the internationally acclaimed Bice Ristorante (17) located at 425 Island Ave. (619-239-2423). The inviting ambience created by a combination of vintage photographs and sleek modern furniture is a fabulous backdrop for their gourmet Italian cuisine. One of the hottest tickets in town is seeing a lively musical at the Lamb’s Players Theatre (18) at the Horton Grand Theatre at 444 Fourth Ave. They present a robust lineup of musicals, dramas and comedies. And the theater is small enough so that everyone has a perfect seat. If you’re driving your car to the performance be sure to purchase a discounted parking voucher from the box office and park in the well-lit underground Ace Parking lot for the Gaslamp Hilton a block away. Tickets can be purchased by phone at (619-437-6000) or online at [lambsplayers.org]. They have a second theater in the heart of the shopping district in romantic Coronado. In the next block at the corner of Fourth Avenue and J Street is a shopping treasure everyone adores. It’s Cost Plus World Market (19) (619-236-1737). This warehouse-sized building carries an incredible selection of imported items from Asia and around the world. Plus, they pride themselves on carrying a fine selection of wines at reasonable prices. J Street is the most popular corridor for foot traffic from the Gaslamp Quarter to East Village. Here is where you will find many more popular restaurants and night spots. You’ll find one of the East Village’s best breakfast spots at the corner of J Street and Thirteenth Avenue. It’s The Mission at 1250 J St. (619-232-7662). This is where hungry diners come for simple, healthy, great-tasting food. Be sure to use their discount coupon. A popular breakfast selection is their blueberry cornmeal pancakes which are decorated with a tart berry purée, powdered sugar and fresh fruit. Also delicious are their Latino breakfast plates, like the pappas loco which are rosemary potatoes served with grilled jalapeños, black beans, cheese, avocado and sour cream. They also have locations in Mission Beach and North Park. See Restaurants. Plus, before, during or after a Padres baseball game, or even when there is no game, Bub’s @ The Ballpark at 715 J St. (619-546-0815) is where locals come to mingle. This casual bar, complete with peanut shells on the floor, features ice cold drinks, classic bar fare like spicy chicken wings and tantalizing tater tots, as well as big-screen TVs to watch your favorite sports. They even have an indoor basketball hoop where you and your friends can HORSE around. If your tastes run a bit more to the refined, then you’re looking for Water Grill San Diego (20) at 615 J St. (619-717-6992) [watergrill.com] which is at the corner of 6th Ave. and J St. They are the hip seafood and steak specialists nearest to Petco Park. It’s open for lunch and dinner. See Restaurants. East Village and the Gaslamp Quarter are two great places to discover trendy restaurants, popular nightclubs and shops all rolled into one memorable experience. 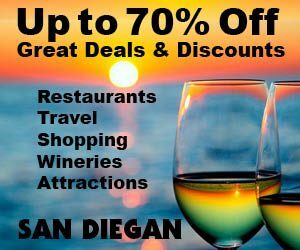 For more information, visit the SAN DIEGAN’s website at [sandiegan.com]. Downtown has changed dramatically. For example, in April of 2004 PETCO Park, which is home to the National League Padres baseball team, opened its gates. Bounded by Tony Gwynn Way (Seventh Avenue) and Tenth Avenue, Imperial Avenue and J Street, the ballpark is a state-of-the-art facility. The ballpark’s advent has spawned a building boom. New residential units, restaurants, shops and hotels have blossomed, transforming a once blighted, industrial area into a thriving urban landscape.